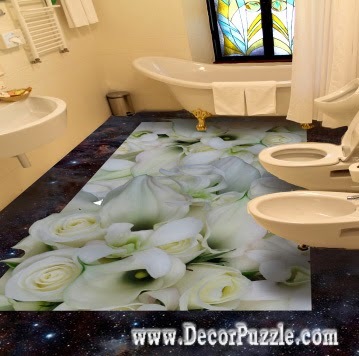 3d floors are one of the unique and contemporary flooring ideas for bathroom office and all interiors, I have provided one of 3d floor art and murals you can see it Full Catalog of 3d floor art and self-leveling floors. If you have to repair the bathroom and choose the finish 3d flooring in the room you just can not pay attention to the technology of polymeric self-leveling floors. 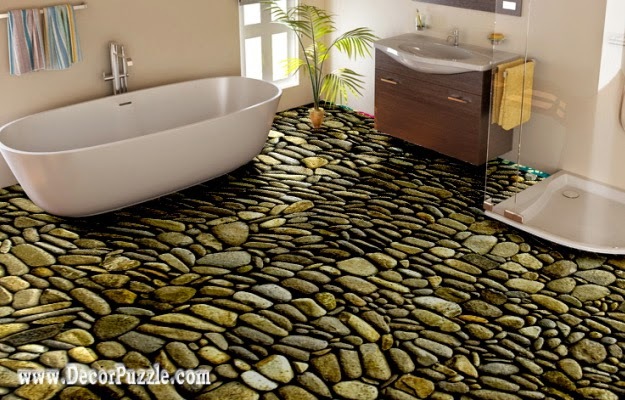 Especially good will look 3d floor in the bathroom. 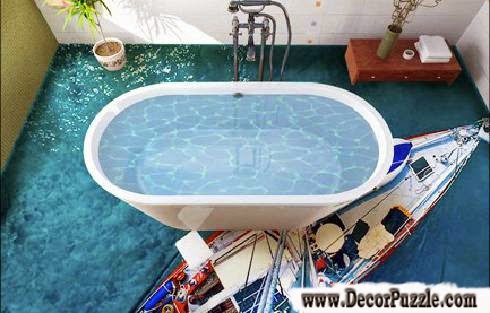 With the highest performance, they hit, and also the opportunity to realize any design solutions. 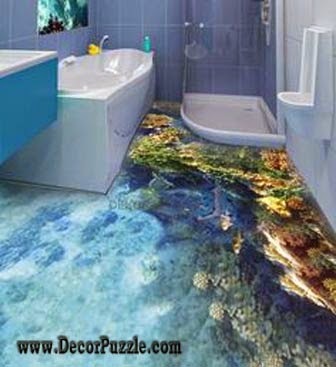 The inlet 3D floor is a seamless flooring material, including a base layer - image and top coat - a thin layer of polymer resin transparent. 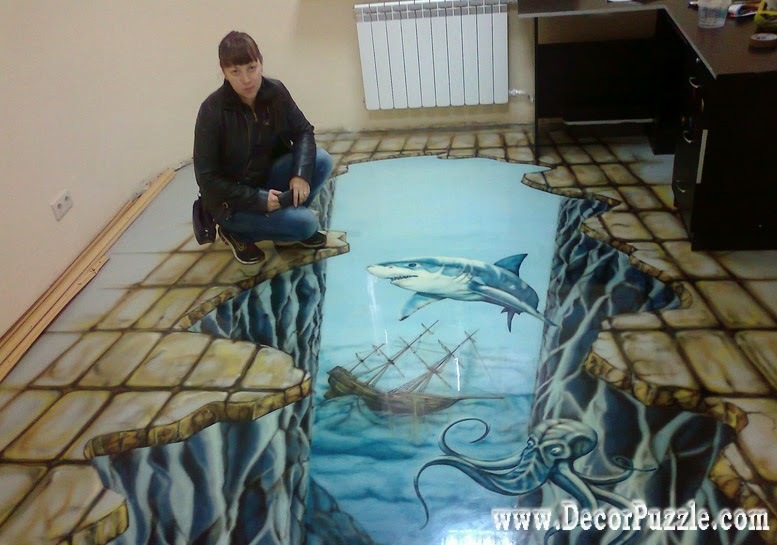 The essence of the technology is that when viewed from certain angles to create a visual illusion of depth on a plane floor. These 3d floors and floor murals can last in the bathroom about 10/15 years. 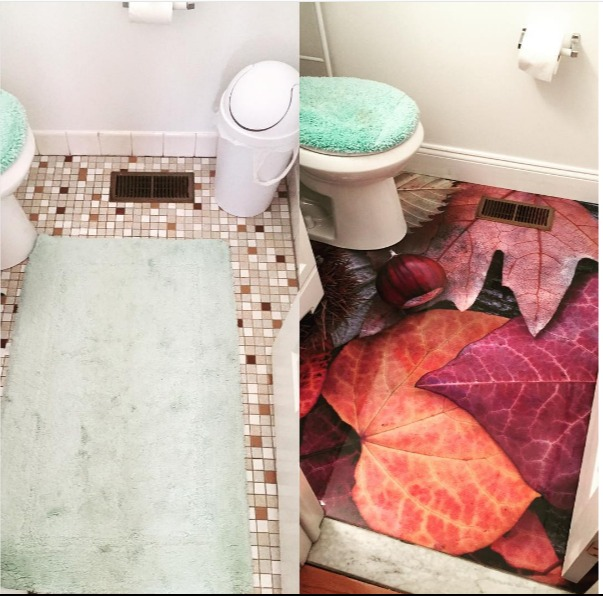 In addition, under them can easily equip any system " warm floor for the bathroom". 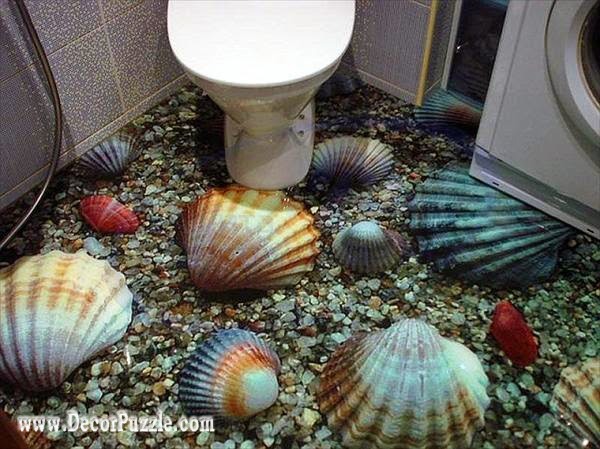 fine decoration, it can be colored sand, buttons, shells, coins, "chips", pieces of metal, etc.. 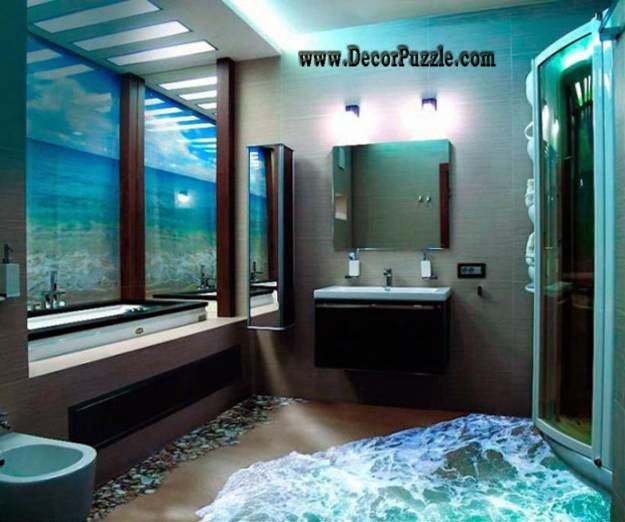 So, what image will have 3d floors bathroom etc., it depends only on you and your imagination. 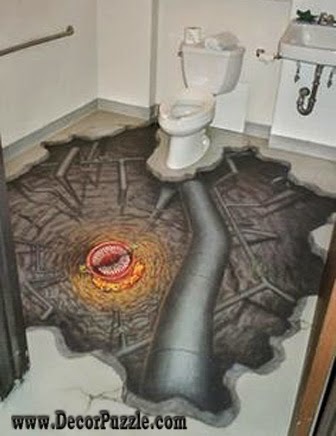 A huge number of options and the picture may be what you want. 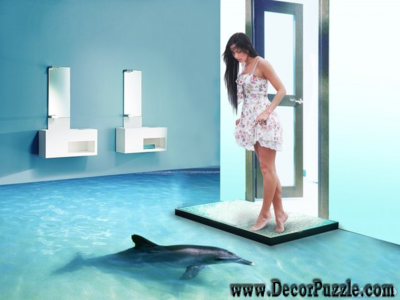 In addition, it can be supplemented with the decor of stone, wood, and metal - they look especially good in transparent polymers. Next, briefly describe the process of resettlement of the coating. Clean and, if necessary, level the subfloor. 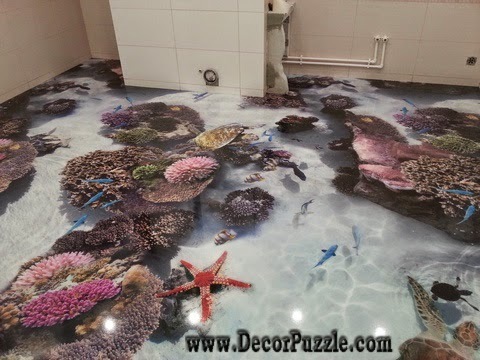 Spot fat, remnants of the old coating, sand, and other contaminants should be removed because it is absolutely clean surface is necessary. Permissible substrate moisture content according to the norms - not more than 4%, so it should be dry. 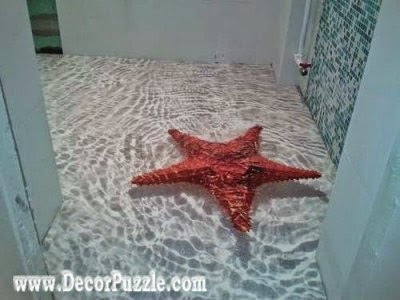 If the floor is cracked, fill them with sealant or epoxy resin to seal the pits and potholes fast-drying a mixture of epoxy resin and quartz sand. Next, remove all the dust. 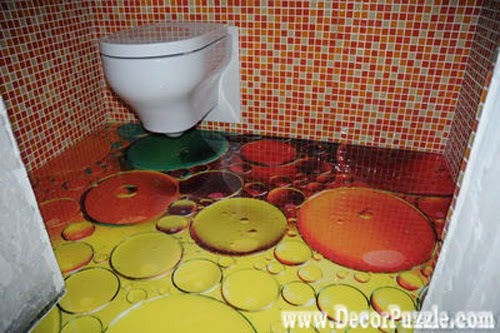 Note that this operation must be carried out at all stages by an industrial or household cleaner. 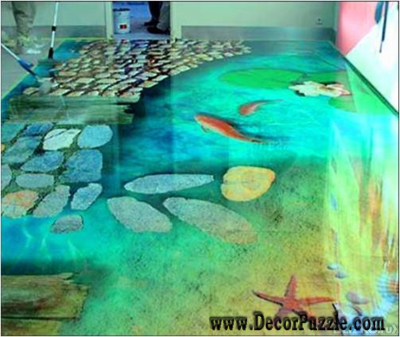 Then, prime the surface using a base composition made from the same polymer as the floors themselves and quartz sand. 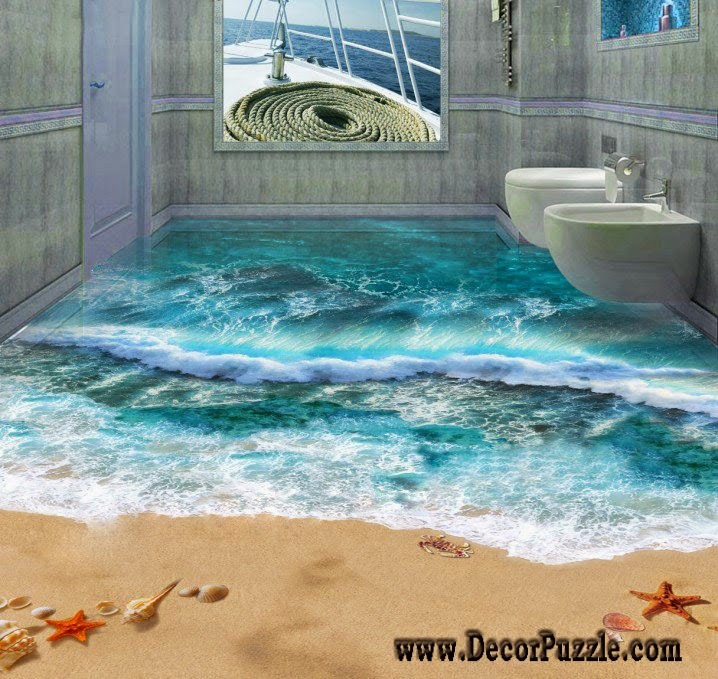 Now you can directly mount the 3d bathroom floor murals and designs. 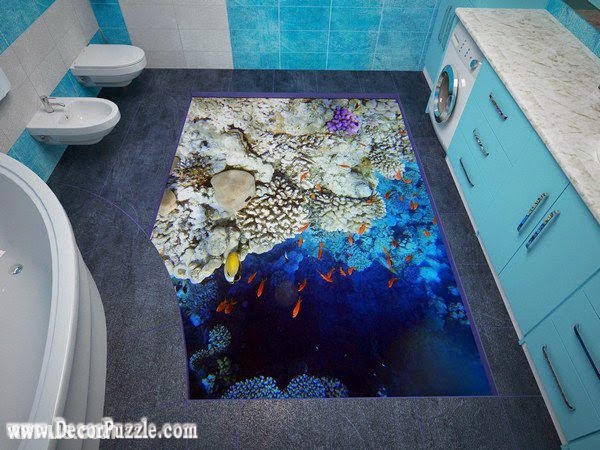 First of all, the fabric glue or tape with the image on the substrate. 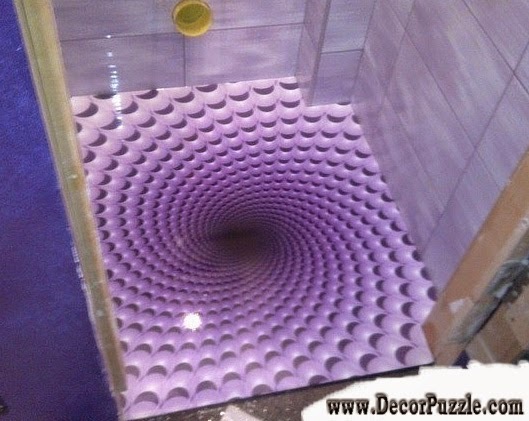 Wait a few days to finish coat is completely dry. 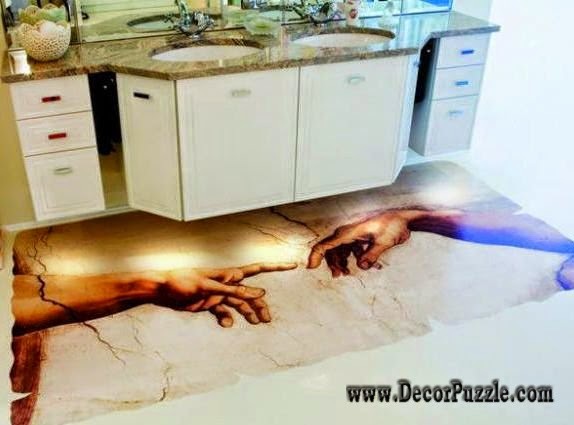 Then polish the surface of the floor. 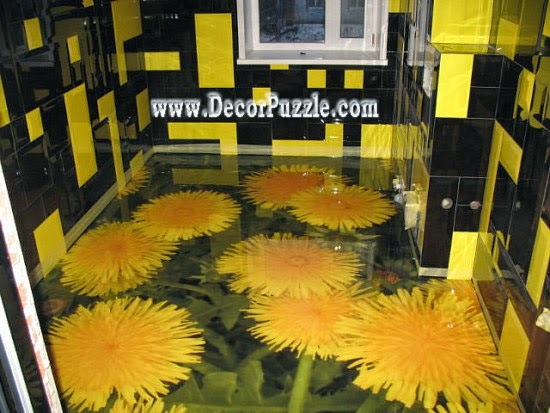 As mentioned above, you can choose either a polyurethane or epoxy 3d bathroom floor designs. The first of these are one-piece, includes only one component. Polyurethane sold already completely ready to fill. Apply a thin layer of it should be, and aligned - with the help of a doctor blade or toothed trowel. If the surface of the polymer were bubbles - remove it, roll a spiked roller composition. Epoxy floors are two-component, consisting of most of resin and hardener. Mix them just before pouring it is necessary to cover. 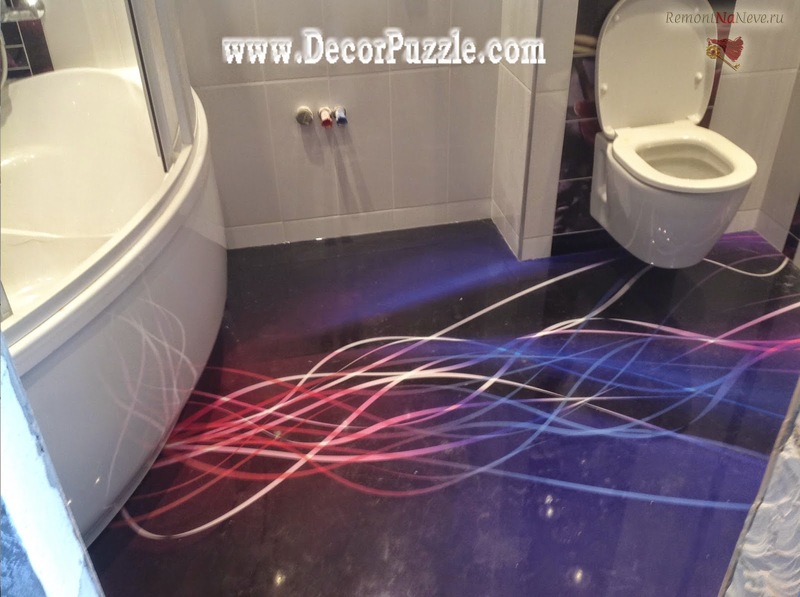 By making the 3d bathroom floor, the polymer blend composition in the required proportions so as to obtain a homogeneous mass. Next, using a doctor blade distribute it on the base. Then roll coating with a spiked roller to expel air bubbles. Dries like covering about 5/6 days. 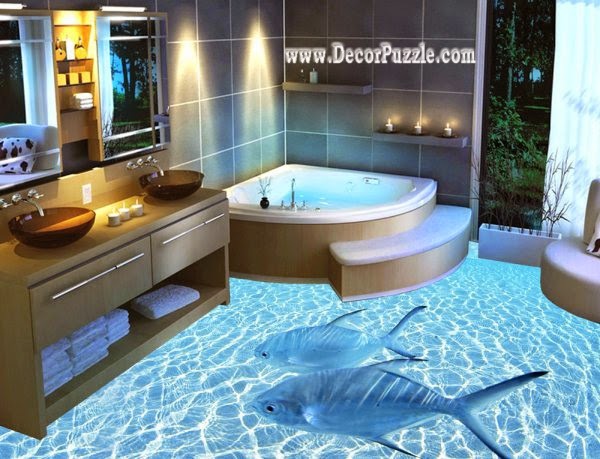 Do not let this period of direct sunlight on the surface of the flooring, otherwise, the coating may dry unevenly. 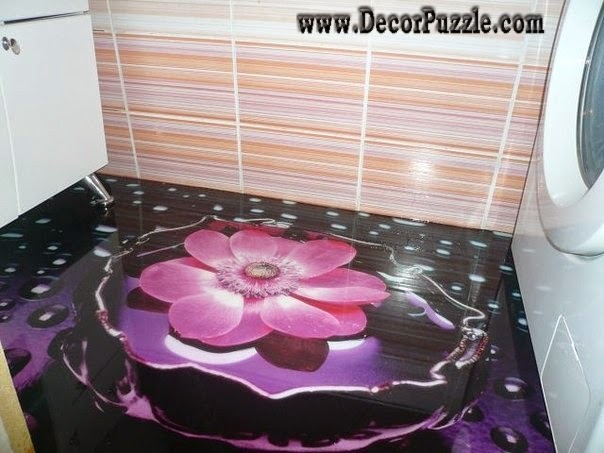 If you want to supplement the glamor gloss finished 3d floors, then apply a polymer lacquer finish.